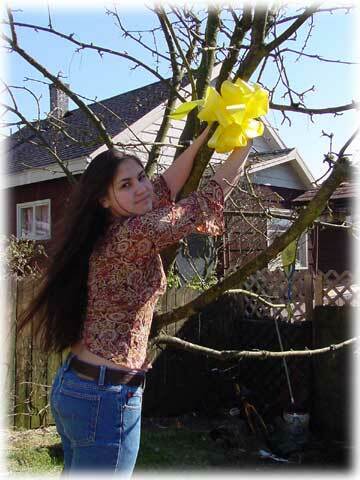 Vicki Pilcher, 16, of Ketchikan ties a yellow ribbon in a tree to show support for her brother, Sgt. Zack Pilcher, USMC. The yellow ribbon is being displayed quite prominently in America these days. We see them tied around trees, on bumper stickers and before our eyes in all sorts of places. The yellow ribbons began appearing in large numbers after the Gulf War when we began sending large numbers of troops overseas to the Middle East.What is the history behind the display of ribbons? For a long time ribbons have been kept as a symbol of remembrance of men and women who served in places far from home. They have been kept especially by wives, mothers and sisters in times of war in memory of their soldier boys abroad. They are powerful symbols of the ties that bind. Many military medals have ribbons attached to them. Ribbons hold a very important place in the hearts and in the culture of the people of Western Christendom. Young women in former times would tie ribbons in their hair, the hair being a symbol of spiritual covering. They would wear a ribbon in a pledge of faithfulness to the one they love. In this they would be telling the world that they are remembering someone. The young lady was set apart and not available for courtship. They are remembering or waiting for someone special. Right now that special person had gone abroad and was not with them. But nevertheless, he was with them in spirit. And what’s more, he will be back! He will be coming home to them some day. Until that day of his return they will wait for him. He occupies a special place in their hearts. They will remember him with their display of the ribbon. And when people ask about the ribbon they will tell others about the one who is being remembered. We see the ribbons in other traditions as well. We present gifts to the ones we love. And around those gifts we wrap them up and tie ribbons around them. We do this to seal and to consecrate them until the one to whom the gift is given can untie the ribbon and receive what has been preserved for them. The ribbons are powerful symbols of devotion. They are emblems of the ties that bind. Back during the times heyday of British Empire the parting of loved ones aboard ship was a very special time. Family members and friends would often be departing for places abroad. Often they would be away for long periods of time. As the ship prepared to pull away from the dock long lengths of ribbon or “streamers” were traditionally thrown from the dock to the people aboard the ship. It was a means of saying “bon voyage” and good-bye. As the ship pulled out to begin its voyage the ribbons would break. This often marked a long and wrenching experience of separation. Some of the ribbon would often be kept in memory of the parting loved one in the hope that they would see each other again. Ribbons are kept in remembrance of those with whom we have a special bond. There is the sense that unless we remember these special ones and lift them up in a communal way they could become lost. This would bring us into a world of desolation. The ribbons are reminders of those whom we love, lest we forget them. We see yellow ribbons on display all around us today. As a nation and as a community the yellow ribbons are out for all to see. We think of our soldiers, sailors, and airmen abroad. They have gone out from amongst us to places far away. Now they are in harms way. Many of them are facing our foes. We remember them. And we pray for their safe return. Many are asking questions about the origin and the meaning of the yellow ribbons. It has been suggested that this is just a recent phenomenon. Some say that it dates back to 1981 with the return of the American hostages from Iran. But have we seen the yellow ribbon before then? Is there an earlier history of the yellow ribbons? Some have traced the tradition back to the song “Round her neck she wore a yellow ribbon”.This song has been around in various forms for 400 years. 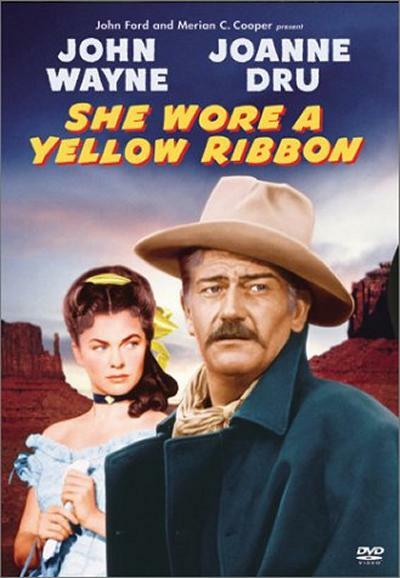 A film with a similar name, “She Wore a Yellow Ribbon” came out in 1949. It starred John Wayne. In this film it is also interesting to note the yellow bandannas worn by officers of the U.S. Cavalry in the 19th century. Is there a military connection to the yellow ribbons? We shall look into that matter later on in this article. Here is a video of the song “She wore a yellow ribbon” sung by Lisa Ono. There are several interesting elements to this song of legend. It may help us in our search for the meaning of the yellow ribbon. In the song, the lady in question testifies to others on behalf of her lover. He may be a soldier or a sailor going abroad. She wears the yellow ribbon to remember him. He was the one who tied the yellow ribbon in her hair. He did this because he would be leaving her for a period of time. According to the song he tied the yellow ribbon in her hair for a reason. It was because of the bold look in her eyes. And it was because of her golden hair. In the symbolism there is a question about the girl that seems to be associated with the meaning of the yellow ribbon. Her lover is not entirely sure of her. There is also a reference to her golden hair. If the girl in question proves true this would seem to be a promise of a future crowning glory. We pick up this theme in the song as it was sung by the Andrews Sisters back in the 40’s. When I asked her, Why the yellow ribbon? She said, It’s for my lover who is far far away. For her eyes were far too bold. Here in this song we perceive that this girl who wears the yellow ribbon has an opportunity to enter into a glorious destiny. And yet we also get the sense that for a time at least, she is being tested. She has a bold look in her eyes. Her lover is not sure of her heart. Now her lover has departed on a journey. He is far from her. But he will return. She has the opportunity to remain true while he is gone. Or perhaps she won’t. She might choose someone else. The song sends out an enigmatic message of warning concerning this girl with the yellow ribbon in her hair. We pick up the same theme in another popular song that came out in the latter part of the 20th Century. It was ‘Tie a Yellow Ribbon Round the Old Oak Tree’. This song was written by Irwin Levine and L. Russell Brown. Here below is a YouTube video of this song. The song appeared in 1973. This was just as the Vietnam War was winding down and many of the Vietnam vets were coming home, sadly, in many cases, to mixed receptions. In a very short period of time the song became extremely popular . In the lyrics we pick up on some other elements woven into the mosaic. We begin to see a larger story. The person in question is returning home after a long absence. Some of the themes we see here are reminiscent of certain well known Biblical stories such as the story of Hosea and Gomer as well as the story of the prodigal son. Here we see types and shadows with some rather profound prophetic meaning. In the song we see a prodigal is returning home after a long absence. He is coming back to his family and friends. The wanderer with a checkered past is returning. We sense he is not the same man who left many years before. He is convicted in his heart about his past. The one who is returning is now a penitent and much wiser man. But as he gets closer to home he wonders how he will be received. As the bus approaches the town of his family and friends his heart is filled with apprehension. His family knows he is returning. But how will he be received? There are so many things in his past. Things which he regrets. He has suffered through many trials and tribulations. And he has learned so many lessons. And so often he has learned them the hard way. But now that is all that is behind him. He is settled in his heart about the new direction in his life. He is coming home. As the bus draws close to his family dwelling he doesn’t want to look. Oh yes, they will be expecting him. But will they remember him with fondness? Will they even want to see him? He doesn’t want to look. So he asks the bus driver to look for him. If his family and friends want to see his face again there will be a sign. A yellow ribbon will be tied to a tree right there at his father’s house. Excitedly, the driver tells him to lift up his head and to look. There he sees a magnificent sight. The tree is full of yellow ribbons welcoming him home! He has been remembered after all. And the time of rejoicing has come. In our search for the history of the yellow ribbon some have concluded that the hostage crisis in Iran was the first time the yellow ribbons were seen across the country on a national scale. Gerald E. Parsons, writing in the ‘American Folklife Center’, has an interesting article on the history and the meaning of the yellow ribbon. He traces the first significant displaying of yellow ribbons back to 1981. This was the year which saw the end of the Iran hostage crisis. This was truly a joyous time of reunion and home-coming. But have we seen yellow ribbons before the 1980’s? Was there an earlier history? Have we seen yellow ribbons worn or displayed by a body of people during a national crisis perhaps during a war? There does not seem to have been a record of any large national display of yellow ribbons during America’s earlier wars. There were a few sporadic accounts of of yellow ribbons being tied to trees for returning servicemen during the Vietnam War. Be that as it may, there is no question that we are seeing a very significant national show of yellow ribbons today. We are seeing them all across the country. Why is this so? Are we entering into some sort of climactic history? And if this is the case, then who are the people of the yellow ribbon? Has there been a national display of yellow ribbons in the earlier history of this company of people? Our search takes us back to America’s early beginnings. There does not seem to be any connection of the yellow ribbon with non-European people groups. So our search takes us back to the European settlers who came to the New World. The yellow ribbon tradition must have been carried in with the white settlers. But which ones? Could the Pilgrims or the Puritans have brought it to America with them? Let us pause here and check out the Puritans. The Puritans were certainly the political and military movers and shakers of their time. And as the 1600’s opened up they had visions of glory and high hopes for a brighter future, both in England and in the New World. But they found that the social, political, and ecclesiastical powers had closed their doors to them. The royal powers, the aristocracy, and the English Church were immovable. These English Reformers found themselves stuck in the status quo. The Puritans found themselves between a Rock and a hard place. They were finding it difficult to bring in the changes they so desperately wanted to see. The Reformation was proceeding at far too slow a pace for them. The Puritans now rising up in the English middle class were not ones to sit around waiting on ceremony. Their grievances were severe. And they wanted immediate action on their demands. The Puritans soon became the leading spokesmen in Parliament. Under the able leadership of Oliver Cromwell, they boldly took their demands for political and religious reform to the king. An awful feud arose between Parliament, and King Charles. The king was supported by the English aristocracy and by the Bishops of the Church of England. The Puritans wanted their national Church of England to be based on the newly emerging Biblical Christianity. They also wanted the king to address political issues. Interestingly enough, these concerns were related to ‘taxation and representation’. They wanted the English Crown to share power with England’s representatives of the people in Parliament. The Puritans became very influential in Parliament. An acrimonious war of words went on for some years between Parliament and King Charles I. It finally erupted into outright civil war. See this video. If we are looking for the yellow ribbon in the essential roots of America then we need to think outside the historical boxes of “American history” and “English history”. Schoolteachers typically showcase the history of the Puritans as they arrive in the New World. And that is where they leave the story. But that does not give the complete picture. We need to trace the history of the Puritans forward, even to our time. And we need to trace the Puritans back into English history. The Puritans took to the battlefield against the king in the 1640’s. It is when we begin to look into the English Civil War that we get our first big break. Right here on the battlefields of the the Puritan Revolution we notice something very interesting. We can clearly see the the yellow ribbons! We see this heraldry being displayed quite clearly on the battledress of the soldiers of Parliament. Indeed, the yellow ribbons are part of the heraldry of the Puritan Army! The painting below is a very famous work. It portrays in accurate and authentic detail a certain event which occurred during the English Civil War. It was painted by W.F. Yeames in the 1800’s. It shows an interrogation of Royalist women and children. They are being questioned by Parliamentarians and military officers from Oliver Cromwell’s Puritan Army. If we take a look at the painting we notice something very interesting. The sergeant and the cavaliers in the Puritan Army along with the Parliamentarian investigators are all wearing a yellow sash. Have we discovered the people of the yellow ribbon? Click on the image for an explanation of details in the painting. In the painting above we see yellow sashes and ribbons. They are associated with a a special people, a company known as the Puritans. These people began their history with the English Civil War. Eventually many of them would migrate to the New World. These people would later go on to provide the main spiritual energy of an important sovereign nation known as the United States of America. This image is from the video “Cromwell”. It reveals America forming within the womb of England in the 1640’s. This is 130 years before the actual birth of the nation in 1776. Here the Puritan Army goes to the Battle of Naseby singing hymns. John Bunyan, writer of Pilgrim’s Progress, was with the Puritans in this decisive battle against King Charles I and his royalist army. Note the the cavalry officers in the Puritan Army wearing yellow ribbons and yellow sashes and the banner ‘In God We Trust’. Quite clearly the yellow ribbons form an important part of the heraldry of the Puritans. The soldiers of Oliver Cromwell’s Puritan Army wore a yellow sash or yellow ribbon. These were worn onto the battlefield. The ribbons were worn as identifiers to mark out friend from foe in the chaos of battle. But was there a deeper sense of identity involved here as well? The Puritan Army was raised up in a hurry. These were middle class people of limited means. They and their families would have taken a hand in preparing their own battle dress. The Puritan ladies, with husbands, brothers, or sons in the Puritan Army, would have been busy. They would have made up those yellow sashes for their menfolk. They were worn over their heavy brown battle coat. This image is from the video “Cromwell”. 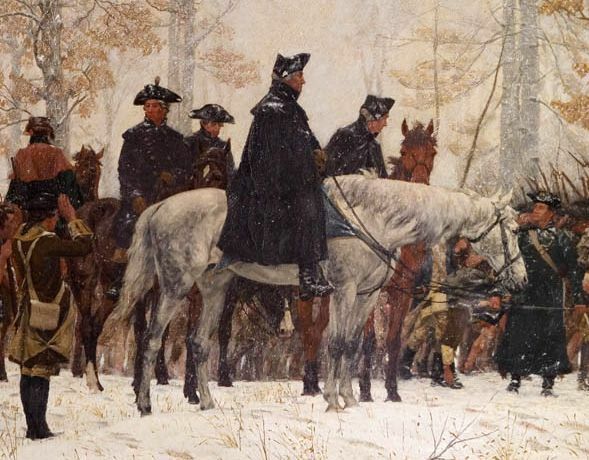 Note the the Puritan cavalry officer on the left wearing a yellow sash. So what is going on with these yellow ribbons? If they are the heraldry of the Puritans then what does this mean? Is this banner before the nations the heraldry of a people who have somehow lost their identity? We see them coming down some well known ancient paths. And judging from the recent reappearance of this heraldry of the yellow ribbons it seems that these same people are still marching on. Even today we see them lift up an ancient standard, a standard that happens to belong to a significant degree to the God of Israel. This is a matter for some pondering and perhaps some historical speculation. Can we connect the dots here? It seems that the yellow ribbons can be traced back at least 400-500 years If that is the case then can we pause for a moment and think “outside the box”? When we do that this question arises. Are the people displaying the yellow ribbons today a continuation of the same people we saw wearing those yellow sashes back during the time of the English Civil War? With our discovery of the Puritan connection to the yellow ribbons another question arises. Are the Puritans still with us? And if so, just where might we find these modern day Puritans in America today? What is their message? And, more importantly, what is their agenda? Is there a modern version of the Puritan Army? And what might be their ultimate destiny? Quite clearly the people of the yellow ribbon are still out there. And as we can readily appreciate they are still voicing the same desire to build a Godly Biblical society, even a ‘nation under God’. So, all that being understood, just how do they plan on achieving this goal? And here is the most important question of all. Will they be successful? It seems that today’s Puritans in America are displaying their historic yellow banners again. Why? And what is the spirit behind all this spiritual and political energy? And if the yellow ribbons are in fact Puritan heraldry then what does this mean for the nation? America is the lone superpower now. How will her future actions affect world history? The yellow banners are being lifted up again after all these years. Why? Could it be that the modern American Puritans are on the threshold of their dream? And as they raise their standards what might be really happening here? Is this a rallying that might be expected before an epic and historic war? If such is the case then we may be about to enter into interesting times. Even as the principalities and powers are raging at the Euphrates River. Any year now we could find ourselves entering into times that try men’s souls. Those future 7 years would bring the epic conclusion to the Seventy Weeks Prophecy. If that is the case then how shall we respond? Surely we can bring some word of exhortation. And the cry should not just be the petition, “God bless America”. This article was originally printed in the Folklife Center News in the summer of 1991 (Volume XIII, #3, pp. 9-11). At that time the Persian Gulf War had inspired Americans to decorate their lapels and their front porches with yellow ribbons for the soldiers sent into combat, once again generating a storm of questions to librarians and folklorists about the origin of the custom. An article written ten years earlier, just after the Iran hostage crisis, Yellow Ribbons: Ties with Traditions, is also available on this site. The late Gerald E. Parsons was a folklorist and a librarian in the Folklife Reading Room for twenty-one years. 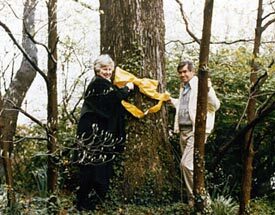 Penne and Bruce Laingen with the yellow ribbon Mrs. Laingen tied around the oak tree in her front yard in 1979 when her husband was held hostage in Iran. Mrs. Laingen donated the ribbon to the Library of Congress in 1991. Photo by Greg Jenkins. During the last decade, no single form of expression documented in the Archive of Folk Culture has stimulated more letters, more phone calls, more in-person inquiries than the yellow ribbon. 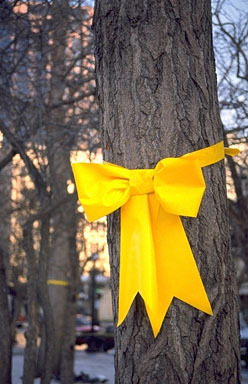 The questions began in 1981 when the Library of Congress received a blizzard of inquiries, particularly from the news media, about the history of yellow ribbons then being displayed everywhere in America in support of Americans being held hostage in Iran. The basic question that reporters had in mind was how the symbol came into being. Many callers had ideas of their own on the subject; some had interviewed the authors of relevant popular songs; others had spoken to wives of hostages in Iran in 1980-81. Still others had talked to historians of the Civil War. Eventually a body of information accumulated, and I wrote an article for Folklife Center News entitled “Yellow Ribbons: Ties with Tradition” (volume IV, no. 2, April 1981). The article outlined the symbolic use of the ribbons in story, song, and real life; and the Folklife Center staff made good use of the article this year , ten years after its publication, when a second blizzard of questions came in about the ribbons displayed for soldiers serving in the Persian Gulf. Is the custom of displaying yellow ribbons for an absent loved-one a genuine American tradition? That question was, and remains, “number one” on the American Folklife Center’s hit parade of yellow ribbon reference inquiries. Often this same question has been asked in a more focused form: People will say, “Is this a Civil War tradition?” –as if an association with that central experience in American history would certify its authenticity. In the last year or so, we of the reference staff at the Center have become aware of a certain shift: a movement from asking about a Civil War connection to asserting one. Some assertions on this subject have verged on the pugnacious; nearly all have made reference to the song “Round Her Neck She Wore A Yellow Ribbon.” That song was recorded for the Archive of Folk Culture in 1938 by Sidney Robertson Cowell in California, but it is much older. For example, there is a Philadelphia printing from 1838 that copies still older British versions. Indeed in the last act of Othello, Desdamona sings one of the song’s lyric ancestors. One version or another of “Round Her Neck She Wore A Yellow Ribbon” has been popular now for four hundred years; so it would not surprise me to learn that someone sang it sometime during the Civil War. All I can say for sure, however, is that it was sung in a movie that was set in the western United States at a time just after the Civil War–a 1949 release starring John Wayne and Joanne Dru. In fact, Round Her Neck She Wore A Yellow Ribbon (the movie) took its title from the song. This film remains the only demonstrable connection between yellow ribbons and the Civil War that has come to my attention, and that a rather weak one. It is the story of two men in a railroad train. One was so reserved that his companion had difficulty in persuading him to talk about himself. He was, he said at length, a convict returning from five years’ imprisonment in a distant prison, but his people were too poor to visit him and were too uneducated to be very articulate on paper. Hence he had written to them to make a sign for him when he was released and came home. If they wanted him, they should put a white ribbon in the big apple tree which stood close to the railroad track at the bottom of the garden, and he would get off the train, but if they did not want him, they were to do nothing and he would stay on the train and seek a new life elsewhere. He said that they were nearing his home town and that he couldn’t bear to look. His new friend said that he would look and took his place by the window to watch for the apple tree which the other had described to him. That passage comes from, of all places, a 1959 book on prison reform. The title is Star Wormwood, and it was written by the eminent Pennsylvania jurist Curtis Bok. Bok says it was told to him by Kenyon J. Scudder, first superintendent of Chino penitentiary. I take this information as evidence that the story was in oral tradition as early as the mid-1950s. I note also the implication of a certain occupational interest in the tale. In October of 1971, Pete Hamill wrote a piece for the New York Post called “Going Home.” In it, college students on a bus trip to the beaches of Fort Lauderdale make friends with an ex-convict who is watching for a yellow handkerchief on a roadside oak. Hamill claimed to have heard this story in oral tradition. In June of 1972, nine months later, The Readers Digest reprinted “Going Home.” Also in June 1972, ABC-TV aired a dramatized version of it in which James Earl Jones played the role of the returning ex-con. One month-and-a-half after that, Irwin Levine and L. Russell Brown registered for copyright a song they called “Tie a Yellow Ribbon Round the Ole Oak Tree.” The authors said they heard the story while serving in the military. Pete Hamill was not convinced and filed suit for infringement. One factor that may have influenced Hamill’s decision to do so was that, in May 1973, “Tie A Yellow Ribbon” sold 3 million records in three weeks. When the dust settled, BMI calculated that radio stations had played it 3 million times–that’s seventeen continuous years of airplay. Hamill dropped his suit after folklorists working for Levine and Brown turned up archival versions of the story that had been collected before “Going Home” had been written. In January 1975, Gail Magruder, wife of Jeb Stuart Magruder of Watergate fame, festooned her front porch with yellow ribbons to welcome her husband home from jail. The event was televised on the evening news (one of the viewers was Penne Laingen). And thus a modern folk legend concerning a newly released prisoner was transformed into a popular song, and the popular song, in turn, transformed into a ritual enactment. Notice that Jeb Stuart Magruder’s return to his home exactly parallels the situation in both the folk narrative and the popular song. The new development, at this point, was that Gail Magruder put the story into action. The next big step was to make the ribbon into an emblem–not for the return of a forgiven prodigal–but for the return of an imprisoned hero. And that step was Penne Laingen’s: On November 4, 1979, Iranian revolutionaries seized the U.S. embassy in Tehran and held Ambassador Bruce Laingen and the rest of the embassy staff hostage. Then in the Post article come the words “Laingen, who has ‘tied a yellow ribbon round the old oak tree’. . . suggests that as something else others might do.” The article concludes with Penne Laingen saying, “So I’m standing and waiting and praying . . . and one of these days Bruce is going to untie that yellow ribbon. It’s going to be out there until he does.” According to my current understanding, this is the first announcement that the yellow ribbon symbol had become a banner through which families could express their determination to be reunited. The next major step was to move the ribbon out of the Laingen’s front yard and into most of the front yards in the United States. That move came about in a particularly American way. With a wonderful exhibition of the spirit that Alexis de Tocqueville thought was a cardinal virtue of our society, the hostage families met and formed an association: the Family Liaison Action Group (FLAG). FLAG quickly found allies among existing humanitarian organizations, most notably an organization called No Greater Love. The goal of FLAG and its allies was to find a way to bring moral force to bear on behalf of the hostages. They seem to have formed their strategy around Emerson’s maxim that “A good symbol is the best argument, and is a missionary to persuade thousands.” The symbol they choose for their argument was, of course, the yellow ribbon. Aided by support from four AFL-CIO unions, No Greater Love made and distributed ten thousand “yellow ribbon pins.” These went to union members, members of hostage families, college students, and in a stroke of marketing genius, to TV weather forecasters. Meanwhile FLAG sent the pins to Junior Chambers of Commerce, scouting organizations, and governors’ wives. Ultimately, the thing that makes the yellow ribbon a genuinely traditional symbol is neither its age nor its putative association with the American Civil War, but rather its capacity to take on new meanings, to fit new needs and, in a word, to evolve. Because the yellow ribbon is very much a living tradition, there is no way to tell who among us may help to steer its course, or in what direction. Last winter, I was in a distant city and needed to buy a spray of flowers. I found a flower shop and explained to the proprietress that I needed an arrangement that would be appropriate for a cemetery ornament. “And would you like some yellow ribbon to tie around it,” she asked matter-of-factly. Pershing, Linda and Margaret R. Yocom. 1996. “The Yellow Ribboning of the USA: Contested Meanings in the Construction of a Political Symbol.” Western Folklore 55(1):41-85. Jack Santino, “Yellow Ribbons and Seasonal Flags: The Folk Assemblege of War,” Journal of American Folklore, 105, #1 (1992), pp. 19-33. Tad Tuleja, “Closing the Circle: Yellow Ribbons and the Redemption of the Past,” Usable Pasts: Traditions and Group Expressions in North America edited by Tad Tuleja, Logan, Utah, Utah State University Press, 1997, pp. 311-328.